I have mentioned it in other blogs that some students express concern about moving to a “small town” or an “unknown city” located somewhere in Upstate New York. As I have attempted to do before, I will again reference some cold, hard facts about Rochester to prove Rochester is most certainly “on the map”. Personally, the most important thing for me to know and understand is the cultural music and entertainment heritage of the community where I choose to reside. To go back to truly wild times, Buffalo Bill Cody lived here, Mickey Rooney began his career here, Kirk Douglas worked in a steel mill here and Bette Davis was actually fired from a stock theatre group. Kristen Wiig is a Canandaigua native, while Philip Seymore Hoffman graduated from Fairport schools. Musically, Cab Calloway was born here and so was Chuck Mangione. Fortunately for current Rochester residents, the Rochester International Jazz Festival is fast becoming one of the most respected in the jazz community as it brings well known and critically acclaimed jazz and blues artists to the area for a week each year. Recent performers included Smokey Robinson, Gladys Knight and Nora Jones. Lastly, the University of Rochester’s Eastman School of Music is considered one of the best music conservatories in the nation, with the Sibley Music Library holding the largest collection of sheet music in the world. As Simon students receive a heavy discount on concert tickets for both student and professional performances, I truly encourage you to take advantage of the dozens of shows held throughout the year. Perhaps music and entertainment history isn’t what interests you most. I also highly enjoy shopping and know the Midtown Plaza was the first enclosed suburban mall in the United States. The Plaza is soon-to-be the headquarters for Fortune 1000 company, Paetec, and as a child I remember rid ing in the Holiday Monorail. It would be quite amusing to see if they kept that ride operational for the executives who move their offices in the next few years…(more Monorail Information found here.) 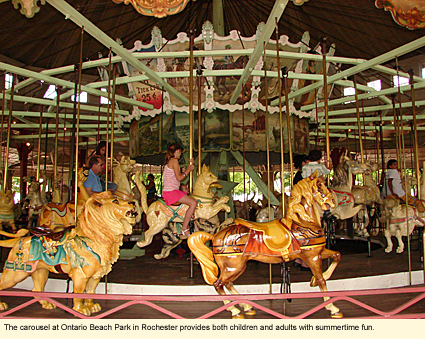 However, if a visitor or resident in Rochester has the need for an equally amusing ride, Ontario Beach Park holds the only antique carousel to never have been moved from its original location. 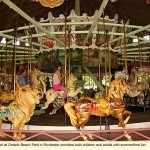 The 1905 menagerie carousel boasts being the first of its kind. Relating to politics, the former police chief and later mayor, Robert Duffy, is New York State’s Lieutenant Governor beginning January 1, 2011. Going back in time, one of our nation’s greatest suffragists Susan B. Anthony settled in Rochester where she led much of the women’s rights movement. The Susan B. Anthony House stands today as a museum and not-for-profit organization. Ms. Anthony is buried in Mt. Hope Cemetery alongside Frederick Douglass, another historic reformer and abolitionist who also had ties to the Rochester area. Regardless of what interests you personally, Rochester has much to be proud of. Whether it’s because Rochester is where the gold tooth was developed, Western Union was founded, or where the first thermometers in the U.S. were manufactured, it continues to grow and offer continual surprises to its residents and visitors. I hope you will come to see this as clearly as I have. *Editor’s Note: it is not advisable to combine all three ingredients for consumption; this could lead to a severe tummy ache. No, I have not tried this myself in case you were wondering. Magnificent goods from you, man. I’ve understand your stuff prior to and you’re just too great. I actually like what you have bought here, certainly like what you’re saying and the best way wherein you say it. You’re making it entertaining and you still take care of to keep it smart. I cant wait to learn much more from you. That is actually a tremendous website.